It quickly becomes evident that Jakob Ziguras is not afraid of forms or rhyme, and this also intrigued me. Many first collections are primarily free verse – here we begin with a number of rhyming poems, all of which relate to ancient history in some way: Akhenaten, Plato, Orpheus, Aristotle and the like. The rhymes are clever and surprising – edge/aslant/sortilege/ignorant – and unlikely to put any reader to sleep. If that doesn’t keep you on your toes, free verse poems are dropped in here and there, so that just when you turn the page expecting another form poem, there is a free verse poem to “lighten the load”. 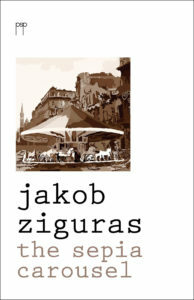 Jakob Ziguras is a poet who is drawn to classical forms and eternal questions. However, in his poems there is no lack of dynamism of imagination and thought, or of contact with what is modern and contemporary. This is a very promising debut. The production of intellectually compelling poems is like forging chains out of snow, or knitting a jumper from moonbeams. It really takes some doing. Here we have an intellectual history of the West, done in lyrics. But also arriving in Australia. Like that history has done, itself—and does. With its hat on crooked, as a rule… Every poem of Jakob’s leaves us admiring the art, but asking more from life itself, if life could ever be said to have a self. Maybe selves, now here, now there, fading or juddering around us. From these remarkable poems I would say what Peter Steele wrote at one point about Jarrell: “he does after all believe in polyvalence, that trait so beloved of the modern intellectual and the modern artist: he is prone to feel, and say, ‘not yet, and not only.’” Jakob has nimbly set himself to do what a poet should do at best: “Precisely say what can’t be clearly meant.” And we shall read him for that eloquent precision. Jakob Ziguras’ recently published book Chains of Snow seems to me the best first book of poems by an Australian poet that I have read for some years. It is a work of astonishing assurance and accomplishment, showing an exceptional range of skills, a highly original voice and an absorption in the European traditions of philosophy, history and poetry which provide him with a remarkable range and depth of subject matter. Whether his point of departure is Greek myth, Egyptian or medieval history, places visited or imagined, things noted and observed, he writes with an almost scientific precision of observation. His great technical skill, as well as his verbal accomplishment, augur well for his future development. Jakob Ziguras’s poetry is born out of that high style of address where intellect and scholarship meet demanding form and produce feeling. He moves through both time and space, from the ancient philosophers through to contemporary observation. He is an elegant and authoritative poet. “What will suffice” begins one poem, quoting Wallace Stevens, ‘will, finally, not suffice; unless a puddle with a petrol spill / suffice to read the gestures of the wind.’ These gestures involve a straight back and firm steps. The halls resound, the petrol spills, and, as Emily Dickinson put it, ‘a formal feeling comes’. Which is, after all, the point. Jakob Ziguras’s début collection is an invigorating blend of the classical and the modern, the formal and the informal. Here is a mature, deeply thoughtful voice which gives immediate pleasure and which will be heard with respect by all. Seldom does a debut collection come with so assured a voice, such technical accomplishment, and such expressive powers at its command. Chains of Snow is a remarkable introduction to the work of a fine new poet, a voice both rich and strange, with a frame of cultural reference as broad as history, from Akhenaten’s city in the desert to mid-twentieth-century Europe, swept by the all-widowing wind of war, to the midnight streets of inner Sydney, ‘wrapped in a body bag / of plastic darkness.’ Jakob Ziguras inhabits a place of constant philosophical probing, but always embodied in the things of this physical world, swarming in their net of sunlight. By turns troubling, haunting and exhilarating, these poems and their music are unforgettable. 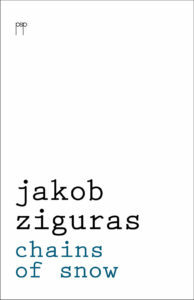 Over the past couple of months, I’ve also been slowly absorbing a book called Chains of Snow, a substantial debut by an Australian poet, Jakob Ziguras. “Substantial” is not faint praise. The book is very serious and intelligent, and demonstrates an impressive technical range and sophistication. Jakob Ziguras was born in Poland in 1977 to Polish and Greek parents and came to Australia in 1984. He studied fine arts before completing a doctorate in philosophy at the University of Sydney. His poetry has been published in Meanjin, Australian Poetry, Mascara, Measure: A Review of Formal Poetry, Snorkel and Southerly. He was a finalist in the Newcastle Poetry Prize in 2011 and 2012, and won the 2011 Harri Jones Memorial Prize and the 2013 David Harold Tribe Poetry Prize. 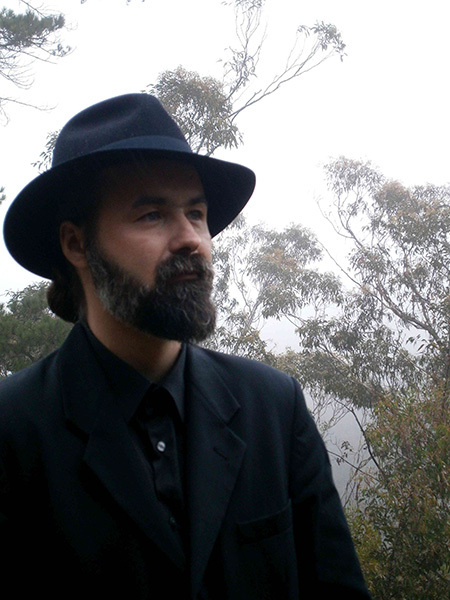 He lives in Poland and the Blue Mountains and teaches philosophy at the University of Notre Dame.